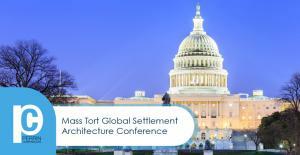 WAYNE, PENNSYLVANIA, UNITED STATES, March 19, 2019 /EINPresswire.com/ -- Perrin Conferences, the leading national provider of joint plaintiff/defense litigation conferences, is hosting the Mass Tort Global Settlement Architecture Conference on May 2, 2019 at the Westin Washington, D.C. City Center. This one-day conference will feature updates and predictions from leading federal officials, in-house counsel, judges, and subject matter experts—all of whom will discuss the current status and foresights of mass tort litigation in the U.S.
•	Kenneth R. Feinberg, Esq., Law Offices of Kenneth R. Feinberg, Washington, D.C.
•	Deborah Greenspan, Esq., Blank Rome, Washington, D.C.
• Joseph Gargan, CEO, The Pension Company, Inc., Washington, D.C.
• Joe G. Hollingsworth, Esq., Hollingsworth LLP, Washington, D.C.
• Richard S. Lewis, Esq., Hausfeld, Washington, D.C.
• Ellen K. Reisman, Esq., Reisman Karron Greene LLP, Washington, D.C.
• Joseph Warren, United States Department of Justice, Washington, D.C.
• Gary L. Wingo, Senior Managing Director, Ankura Consulting Group, LLC, Washington, D.C.
Perrin Conferences is applying for approximately 7.0-8.4 CLE credit hours, depending on the state. Please contact Katie Milnes at kmilnes@perrinconferences.com for any questions and to submit your CLE requests.